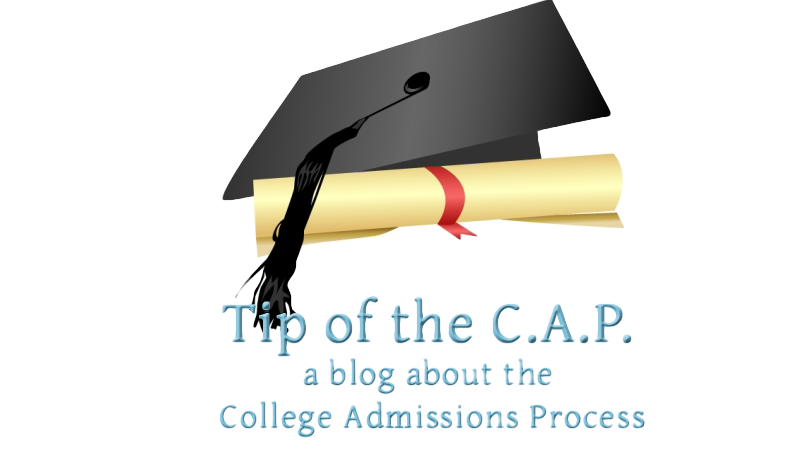 As you may know if you’ve visited this blog in the past, and in the interest of full disclosure, I am a former college counselor and now work for Method Test Prep, a company that partners with over 1,000 schools, community organizations and independent counselors to help students prepare for the ACT and SAT. My company has an online ACT/SAT program, so while I see everyone in the college admissions field to be colleagues, it’s reasonable for a reader to consider us to be in competition with ACT in the online space. Also, I sincerely think it’s great that ACT and SAT no longer persist in the idea that their tests can’t be prepared for and applaud them for investing to provide free resources for kids. 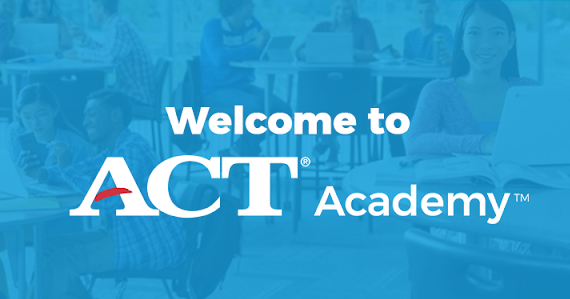 As a citizen I’m rooting for them to provide excellent tools for students, but I don’t think ACT Academy is there just yet. When ACT rolled ACT Academy out in the spring I speculated that it was a “Trojan Horse”; less of an ACT preparation software tool and more of an attempt to make ACT, Inc. schools’ preferred clearinghouse for online video resources in their curricula. Colleagues of mine who looked it over were surprised to see that much of the material was not actually relevant to the ACT test, but rather was related to “high school subjects” writ large. First, the webinar was not a strong presentation. Besides filling it with advertisements for future webinars and publications, IT WAS A PRE-RECORDED WEBINAR FROM AUGUST, though that wasn’t admitted until I asked. Because ACT has chosen to show this in recorded format I assume that they are comfortable with my quoting the presentation and that nothing in it is “misspoken”. The session was led by Deb Rolfes, ACT’s Senior Manager of Content Marketing–she was on live answering questions via text, but the two presenters were pre-recorded, which led to a lot of disconnect. For instance, apparently 95% of attendees today were 9-12 teachers, but the recorded presentation kept talking about elementary school users. It also kept referring to September 6th in the future tense. I’d expect better from such a large organization that gives so many presentations. Secondly, I was surprised that we were told no less than five times that “ACT is a non profit organization”. As in “Did you know that ACT is a non-profit organization? We donated over 660,000 fee waivers last year.” I mean, yes this is technically true for taxation purposes, but it felt like a concerted effort to make the audience see ACT as a friendly non-profit instead of the multi-million dollar enterprise it is. Because is it really a “donation” if you give away something that can only be used for your own product? The pre-recorded presenters were Lisa Wolf, Director of K-12 Partnerships (who seemed to be on a speakerphone and was hard to hear) and Polina Babina, Product Manager for ACT Academy. The format was that Lisa would tee up discussion topics and Polina would go in depth, though sometimes Lisa chimed in with some further details. Polina began by telling us that ACT Academy as initially launched was “a toe in the water” and was just ACT prep for students. But now they have a “giant catalog of over 500,000 resources (videos and games). We can track how they are used to help students. Our videos help students grasp the concept and DO NOT TEACH TO THE ACT TEST.” The capitalization was Polina’s not mine, so that does seem to be confirmation of my theory. 1) Are you in licensing agreements with content providers? Is material made for you, or are you linking to pre-existing content? A. “We have both-we work with Open Educational Resources (OERs), we have partnerships directly with many of our content providers. It is NOT made especially for us. 2) How many of the 500K resources are ACT Prep? For question 1, I think that in contrast to the custom SAT-specific content created by Khan Academy through their partnership with the College Board, this offers much more material, but since it isn’t focused on a particular topic or area it can seem much more diffuse and hard to find the specific content one needs. Also, since it comes from an array of sources, the presentation style and methods of instruction are by definition inconsistent. For the second question, again, I think that we can see that while the product is called “ACT Academy”, preparing students for the ACT is not even close to its primary function. A new feature since early September is that teachers can create classes and assign students to them to easily keep track of what their kids are working on and to see what they are learning. 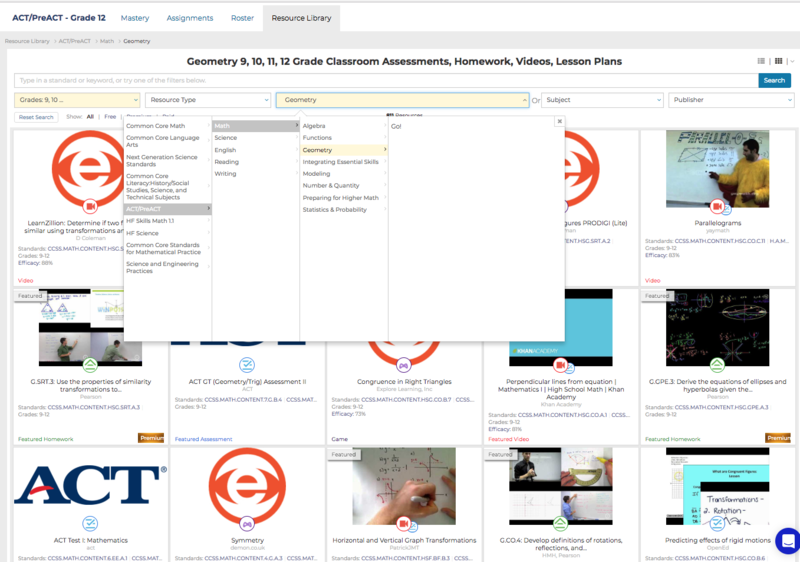 Teachers choose the grade/subject and level they are teaching and can even pick the textbook they use and will find pre-selected, “curated” suggestions for videos and games kids can use. I spent 12 years teaching history and I always appreciated the teacher resources that came with my textbook, so I can definitely see how a teacher might find this valuable. But I’m not sold on the execution. I set up a teacher account for myself, telling the program I was an ACT Prep teacher and the screenshot below is what I get when trying to find resources for geometry. The results are not that easy to navigate and it’s not clear which of the resources might be more “geometry” than “ACT geometry”. In my job I work with teachers all over the country, and in my experience many of the “test prep” teachers in our schools are not trained in, or experts on, the ACT and SAT. That’s fine, and programs like this could help them to help their students, but I would worry about option overload leading to analysis paralysis if I had to decide which two or three videos to use for tomorrow’s class. The program now offers a report called the “Mastery Chart” that will show student by student performance on every quiz question they’ve answered. Interestingly, it compares a student’s success to her CLASS, but not to the total user base, which seems like a missed opportunity. The Mastery Chart will also suggest specific videos and games to send to individual students. Cool, but again something that could be pretty time consuming if a teacher had to decide what individual items to send to every student in class. Teachers who have already assigned students to a class can click on “Voluntary Resources” to see what work kids have done on their own. Apparently this has been “extraordinarily successful” with beta testers, whatever that means. Where this can be helpful would be in a self-paced scenario; a college counselor in school could log in to ACT Academy and look at what a student has been working on to prepare for a meeting to discuss testing strategies. That’s cool! But it can only happen if the teacher has created the class already. It seems that students can be batch uploaded, which might simplify things, but there are definitely some pre-requisites before all of our colleagues can start pulling reports. When I first saw ACT Academy in the spring I thought that it was odd to see links to “premium” paid content for students. Apparently “95%” of teacher resources are free, but they do have test banks from Houghton Mifflin Harcourt and Pearson that schools can subscribe to for $10/month/teacher. Coming in October will be special “academies” for ASPIRE, WORKKEYS and other ACT products. Also there will be an “engine” that will tailor resources to every student in every subject (right now, the robot only suggests content to kids in the ACT mode). So what is it? “One ring to rule them all, and in Iowa City bind them”? Or “Um, I don’t know?” I suspect the latter…at least for now. This looks like it could definitely grow into a fine technology clearinghouse for a school or district willing to trust ACTs “curation” of resources to help provide their teachers with indexed audio/visual resources across the K-12 spectrum. But as “ACT Prep software” I still think it is bewilderingly overcrowded and unwieldy. Thanks for reading, and I’d love to see your thoughts in the comments!